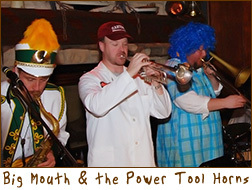 "How Sweet It Is" to listen to Big Mouth & the Power Tool Horns, one of Green Bay’s most talented group of musicians. As a bonus, on Halloween, the night of tricks and treats, where even the band members were garbed in costume. For nearly three decades, Big Mouth has been entertaining building a faithful following. The bands originator, Jay Whitney (guitars, vocal), has been a constant, writing most of the bands original songs, with favorites like "Blow My Top", "Chains", and "Blackhole Boogie". The Power Tool Horn contingent showcases their talent with saxophones, trumpet, and trombone giving the band its amazing Power filled sound. Tying in guitar, keyboard and drums complete their "progressive blues" flavor, as described by Marc Jimos, sax player and vocalist. Selections from Stevie Wonder, Paul Simon and Peter Gabriel, just to list a few, always rock the house. This is a group that commands its audience to feel the music and have fun, making them part of the process by passing out tambourine, wood block and other various percussion pieces. Witnessing the amount of people out on the dance floor (myself included) it is easy to see the crowd is more than happy to oblige.